Beaver Mines, Alberta: The ad hoc group, Stop Castle Logging, will hold a rally on Thursday, September 23, starting about 8:30 a.m. outside the Bayshore Hotel in Waterton Lakes National Park where local MLA Evan Berger will be addressing the conference Remarkable Beyond Borders: Shaping the Future of the Crown of the Continent. The rally is intended to let Mr. Berger and the conference attendees know that plans to allow Cochrane-based Spray Lake Sawmills (SLS) to clear-cut log in the Castle Special Place west of Pincher Creek, Alberta, are unacceptable. The provincial department of Sustainable Resource Development, of which MLA Evan Berger is Parliamentary Assistant, has given SLS permission to clear-cut log in the area between Beaver Mines Lake, Castle Falls and over Carbondale Hill into Lynx Creek. This is a prime recreational area that includes provincial campgrounds and Scouts Canada’s Camp Impeesa. The area is also considered core grizzly bear habitat for the Alberta grizzly bear recovery plan, and is a key component of the Crown of the Continent Ecosystem. Much of the area is zoned critical wildlife. Members of the Stop Castle Logging group and others have been writing, calling, and meeting with Mr. Berger for months now, but Mr. Berger seems more intent on promoting the interests of Spray Lake Sawmills than on representing the views of his constituents. There is no doubt that the Castle area is one of the most beautiful places in the world. It seems a shame to me that Sustainable Resource Development (SRD) Minister Mel Knight’s decision to allow clear-cut logging in such a beautiful place. Much of the area slated for logging is on the government’s land-use plan zoned as Critical Wildlife and along with Beauvais Provincial Park, zoned as General Recreation (not “multiple-use” which is multiple industrial uses including logging). So that makes one wonder how these so-called officials can make these decisions without taking into consideration the fact that the area is loved and cherished by not only those who live in the area, but those who enjoy visiting year after year. Spray Lake Sawmills, located in Cochrane, west of Calgary estimates they will now be taking 3,750 truckloads of logs from those public lands for their Cochrane mill more than four hours haul away. The logging license, which will consist of clear-cut blocks, is centered in the midst of the Castle’s five Provincial Recreation Areas (campgrounds) and Scout Canada’s Camp Impeesa. In this person’s opinion logging will hurt fish and wildlife, grizzly bears and rare tree species, it will also damage what is now a healthy watershed even after the slow-growing forest is replanted. However, Alberta’s department of Sustainable Resource Development, which is responsible for the land, said the plans for harvesting the timber have been on the books for decades and can be done in a responsible manner. Government officials say it’s an issue of forest health. They also say that logging will help prevent the spread of mountain pine beetle, they say. But will it really ? People need to stop and realize that once this beautiful area is gone…. It is gone. A Stop-Castle-Logging Rally will be held on Thursday, Sept 23, starting at 8:30 a.m., outside the Remarkable Beyond Borders: Shaping the Future of the Crown of the Continent conference being held at the Bayshore Inn in Waterton Park. More information will be posted here early next week (Sept 20). Please plan to come out and support the effort to Stop Castle Logging! Click here to download a petition form that can be printed and signed. Check out the Calgary Herald’s front-page story on the proposed logging. Beaver Mines, Alberta: Some area residents, small business owners and outdoor enthusiasts gave up part of their Labor Day long-weekend to work in sunshine and rain to alert the hundreds of campers in the Castle Spe­cial Management Area of the local MLA’s and Sustainable Resource Development (SRD) Minister Mel Knight’s decision to schedule the centre of this popular Special Place for clear-cut logging. Located west of Pincher Creek on public forest lands between Waterton Lakes National Park and Crowsnest Pass, the Castle is listed by Alberta Tourism, Parks and Recreation as one of Alberta’s 81 Special Places. Much of the area slated for logging is on the government’s land-use plan zoned as Critical Wildlife and along with Beauvais Provincial Park, zoned as General Recreation (not “multiple-use” which is multiple industrial uses including logging). The volunteers spent Saturday and Sunday of the long-weekend handing out flyers to campers, getting a sense of where people who recreate in the area come from and collecting signatures on a petition. West of Beaver Mines near the entrance to the Castle, a sign reads, “Help us! 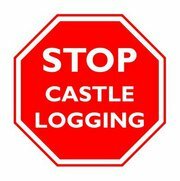 and gives a website address with information: http://www.stopcastlelogging.org. People were given the addresses for Minister Knight and his Parliamentary Assis­tant and local MLA, Evan Berger, so they could send their concerns directly to them. On the long-weekend, 155 campsites were visited and despite running out of petitions on Saturday, 256 signed against the logging. There were first time visitors and those who have been coming to the Castle for more than a decade, some 30 to 40 years. People come from as far north as Red Deer, as far east as Medicine Hat and from all over southern Alberta, as well as a few from BC and outside Canada. The largest portion (38%) came from Lethbridge, with the next largest numbers coming from Calgary (15%) and the immediate local area (14%). “By their comments on the weekend, there’s no question that people value the area. Most were about the logging, with many comments ranging from its tragic to crazy,” observed Jolaine Kelly, who with her husband owns a nearby bed and breakfast. You are currently browsing the Stop Castle Logging blog archives for September, 2010.